Our first, weekly, Thursday coffee cupping was a huge success. We had several new customers join in, the Tazza D’Oro baristas and some of our regulars. It was a great turnout for 4:30 in the afternoon. Next week we will definitely have more cupping stations. On Thursday we cupped 2 coffees that were highly recommended by our roaster, Batdorf and Bronson – Guatamala Antigua Finca El Valle and Ethiopia Natural Limu. We cupped these coffees based on three basic types of evaluations; aroma (dry and wet), taste and mouthfeel (body). Aroma is about the fragrance of the coffee. The taste evaluation encompasses a few different concepts, acidity (bright, tart sensation around the edges of the tongue and at the back of the palate), body and flavor. To help us connect our tongues to our brains we had strawberries/blueberries and aged balsamic vinegar (Ethiopia Limu) and ground cocoa, chili power, chocolate and rum(Guatemala Antigua) on the tasting table. First we discussed the coffees and the regions where the coffees are sourced, Then, we sniffed the fresh ground coffee dry (dry aroma), then added hot water to the ground coffee and sniffed again (wet aroma). After the sniffing we removed the coffee grounds that rose to the top of the cup then slurped away trying to identify familiar descriptions. Here is what we found: Guatemala Antigua Finca El Valle to be spicy,earthy, medium bodied, notes of cocoa and beef. The Ethiopia Natural Limu to be very blueberry like, creamy, medium bodied and somebody could actually detect the balsmaic vinegar over the fruit in the Limu. Antonio and Josh then made French Presses of the 2 coffees and we basked in the knowledge and connection with the coffees we were all enjoying. 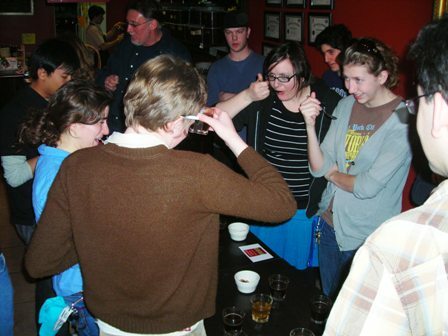 Next Thursday, March 20th, Emily will take the lead on our cupping. She will talk with Aaron at Batdorf and Bronson on Monday and pick the next two coffees. Again, we will cup coffees every Thursday at 4:30 pm and if you can’t make it stop in between 5:30 and 6:30 pm and we will make you fresh samples of the coffees and give you all the background on them.